The uniqueness of the works of Franz Kafka and the perplexing historical accuracy of the concept of the Kafkaesque are both phenomena that over the years have been noticed by many readers and scholars. This book sets out to unravel the enigma of this very concept, by reference to the process of creation, and to Kafka´s implicit use of two unconscious levels within the universe of discourse of his most important works. Always a fruitful explanation of the uniqueness of these works has been missing. Scholars have ever since the 1930s been noticing the extraordinary qualities of the Kafka text. 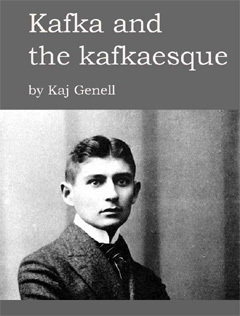 Strange - Kafkaesque - features have been attributed to the short stories and the novels of Kafka. The Kafka hero has - rightly - been seen as a mere figure, and the " dream-like " landscape-universe has been seen as characteristic, and one has frequently been looking upon these entities, together with a few stylistic features, as technical dominants in the shaping of the concept of the Kafkaesque. This book displays a model, together with a biographical survey and a historical perspective on possible influences, that, quite reversely, forms a hermeneutic explanation to these features, as well as to what is denoted by the concept. This is achieved from the perspective of a dynamic contextual center, explained in a model containing three levels, levels steadily forming the discourse, typical of Kafka. The veil of mystery may never be lifted when it comes to Kafka´s classics of Modernity. It might be essential to know about the technique behind the Kafkaesque to be able to reflect upon the Self-consciousness of Modern Man of the 20th century, a century so intensely marked by a dialogue between society and the works and ideas of Sigmund Freud. Self-consciousness of Man, as it appeared with St. Augustine, the great Italian Renaissance writers, Erasmus, Shakespeare, Montaigne, the German secular Romantics and Hegel, swiftly developed into something even much more complex with the appearance of Freud and the publication of his Traumdeutung in the year of 1900, and, more so, with the creation of the Kafkaesque, with the works of Kafka, around 1912. Quite early in life - I was born in 1944 - I got interested in reading books of high literary value. I disliked Thomas Mann and I soon developed a taste for good novels like those by Jane Austen, Joseph Conrad, Virginia Woolf and Melville, to mention a few, all of which also well illustrate my broad taste. Since I was brought up in Sweden I, of course, also read all the classics of the Swedish language, like Strindberg and Almqvist, which are the main figures when it comes to dense, thrilling, prose in Swedish. I later discovered Kafka, and the literature of ambiguity. It was around 1968 when I already had studied at the University in Gothenburg for some time, History of Arts, Philosophy and General Literature. I lived in a small cold flat in the centre of the town and my eyes had fallen upon a small torn used volume by Kafka in German, the novel Amerika . I earlier was damiliar with The Metamorphosis , and then in Swedish. Anyway, since I had read German in school, I started out with my small pocket version of Amerika, and I was immediately struck by the immense and very odd beauty of the first sentences in this book, in its original shape, in the language it was written in. I read the whole book through, without even once consulting any lexicon. I guess I must have missed a detail or two, since my German was far from exquisite. I was hooked up by Kafka. I read all he had written, and in the University I wrote small essays and subject papers on Kafka ( The Metamorphosis ). It was one major problem that soon became central to me. How did Kafka do, to acquire this formidable effect, the Kafkaesque, an effect that scarcely ever anybody, but some of the German Romantics of the early 19th century, had managed to create anything even remotely similar to? I began my research concerning this problem in 1972. The answer to my question did not show rapidly. One day in 2001, late in the evening, I, all of a sudden, got the idea. I started to investigate this idea further, and now began an intense study of the Kafka literature in order to find out whether I was alone in my discovery, or not. I was. Now I was ready for my second challenge. How could I explain my views in the best possible manner? Since my understanding of the subject matter was broad, and a result of many impulses, and since it came close to the understanding of various other human phenomena, I decided to let my work reflect these vast fields in order to make it possible for my reader to draw his and hers own conclusions, many of which I have decided not actually to draw myself, but which all are there implicit. The result is: Kafka and the kafkaesque. I sincerely hope you do enjoy! © Kaj B. Genell 2017 All material on www.kajgenell.com © Copyright Kaj Genell 2017.